MK Ohayon to demand urgent discussion over Haifa U's refusal to grant doctorate to Professor Aumann for political reasons. MK Shimon Ohayon (Likud Beytenu) said on Sunday that he will demand an urgent discussion both at the Knesset plenum and in the Knesset’s Education Committee, over Haifa University’s decision to refuse to award an honorary doctorate to Professor Yisrael (Robert) Aumann due to his pro-Israel politics. 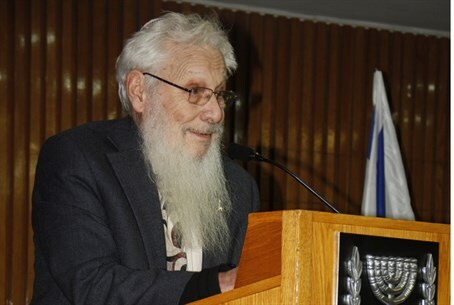 Ohayon added that Haifa University is an institution that is budgeted by the state and, as such, is committed to conducting its deliberations based solely on the academic contribution of different people and not according to political positions. The University of Haifa, for its part, claims that the decision is not yet final. "The selection process for candidates for honorary doctorate is the process has several steps, which only ended up being published with the names of recipients and the reasons [behind the candidacy]," it stated. "The process is not yet over, and discussions along the way are internal and are not for publication." Earlier this year, terror victims' advocacy organization Almagor publicly spoke out against the university for providing legal aid to convicted terrorists and murderers.